In the Pacific Northwest, most gardeners are familiar with rockroses, the aromatic Mediterranean shrubs in the genus Cistus; some of them, primarily C. x hybridus and C. x purpureus, have become landscape staples. 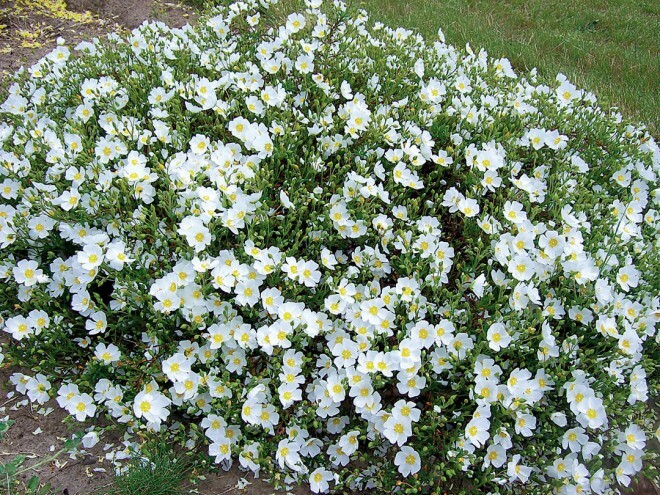 These and other selections have been used as evergreen groundcovers in dry, poor soils-situations in which Cistus thrive. Given the familiarity of the rockroses, it’s surprising how few of their cousins in the genus Halimium are known and grown. Although, in many aspects of their origin and culture, the two genera are the same, Halimium species are quite distinctive in their appearance. 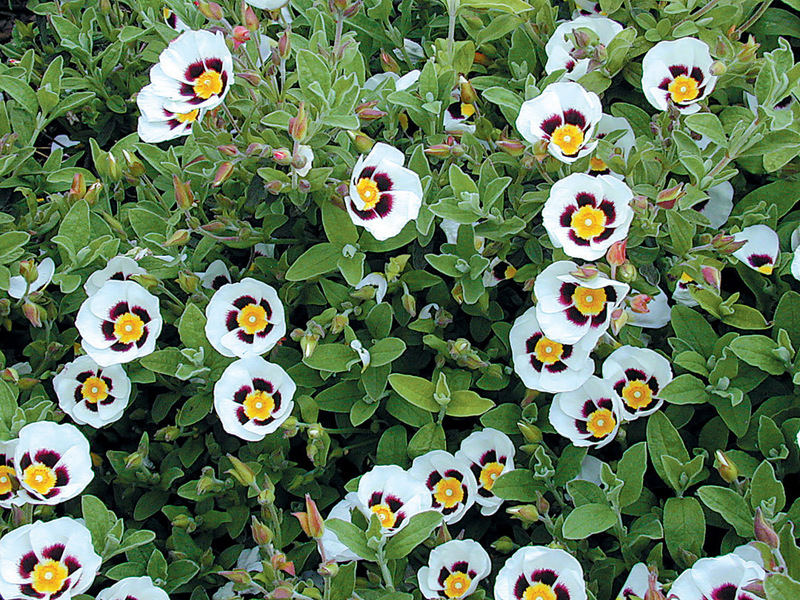 Like Cistus, Halimium are Mediterranean shrubs; most of the seven currently recognized species originate in southern Europe, especially in Spain, Portugal, and France, as well as in North Africa. The hybrid of the two genera, xHalimiocistus, consists of several taxa that, for the most part, have arisen in cultivation where plants of Cistus and Halimium were growing near each other. Seedlings raised from such plants possess characteristics intermediate between the suspected parents. Some of these hybrids have become fairly well represented in cultivation, with xHalimiocistus wintonensis perhaps the best known. The various species of Halimium and xHalimiocistus make up a diverse group, ranging from small to fairly large, prostrate, mounding, or upright-growing shrubs. All have opposite leaves, which may be mid- to dark green but are often distinctly silvery. This is one characteristic that distinguishes many Halimium from Cistus. Flower color also characterizes the two genera: all but one species of Halimium have yellow flowers–a color that is absent from Cistus. The five-petaled flowers usually drop their delicate petals after being open for only a few hours. The following morning, however, a new group of flowers will bloom; the display continues for two to three weeks, but sometimes far longer. Two species, H. halimifolium and H. lasianthum, have a reddish or dark brown blotch at the base of each petal; some selections of other species share this feature. The spent flowers develop into reddish or dark brown capsules, which split open to reveal numerous small dark brown or blackish seeds. Originating in the Mediterranean, Halimium are well adapted to a climate with hot, rainless summers and winters that are wet but not excessively cold. They are, therefore, at home in the Pacific Northwest. Because of the fairly wide geographic distribution, Halimium species range from somewhat tender to dependably hardy. Halimium atriplicifolium is reputed to be the most tender of the bunch, although it seems to survive a “typical” winter in the Pacific North-west. Temperatures in the high teens will cause some leaf burn, but not significant damage. Because of their tolerance for poor soil and drought, Halimium are well adapted to growing along dry banks and other locations where water is limited. This is the sort of situation where these, along with other Mediterranean shrubs, are best used. Some of the problems encountered with them, such as stem dieback or death, can probably be attributed to over-irrigation in the summer-usually because they are placed in beds alongside thirsty plants like hydrangeas, rhododendrons, or tea roses. Nevertheless, Halimium benefits from a bit of extra care in both placement and soil preparation: a sloping site will help surface water drain away rapidly, and the addition of some organic matter and, perhaps, some sharp gravel to a heavy soil will improve soil structure and drainage. Another note that bears mentioning pertains to nursery production. Most nursery plants are container- grown in a water-retentive organic soil medium, derived mostly from bark, which is totally unlike the gritty soil to which Halimium are native. After planting in the garden, this organic material sits around the crown of the plant, sucking up and holding moisture all through the rainy winter. This may contribute to the crown rot and dieback symptoms seen on some plants. To minimize such problems, it is probably best to purchase (or raise) plants grown in a well-drained medium, such as bark well amended with pumice. To further minimize the amount of organic material around the crown, purchase smaller containers (one-gallon or smaller). The plants grow quickly anyway, so there is little advantage in starting with larger sizes. Flowering time varies significantly among the species and selections of Halimium. The earliest ones to open are H. calycinum, H. lasianthum, H. umbellatum and xHalimiocistus ‘Ingwersenii’. 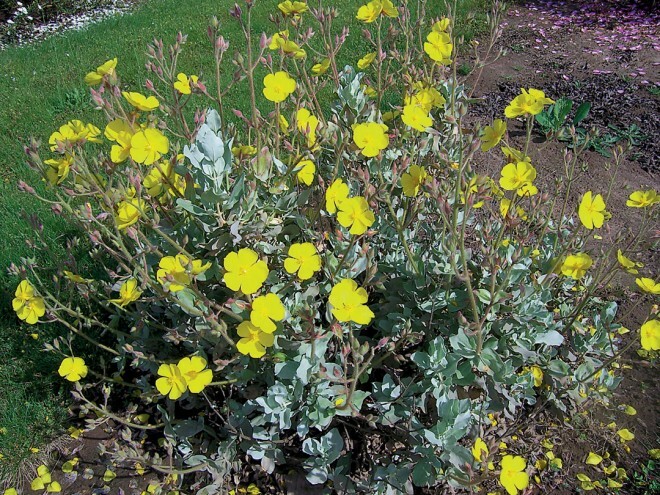 In the Pacific Northwest, these plants are flowering by mid- to late April (before any Cistus selections begin to bloom). By early May, xHalimiocistus wintonensis is in bloom, along with xHalimiocistus sahucii and Halimium x pauanum, the last flowering well into July. Halimium ocymoides and H. atriplicifolium begin near the end of May, along with H. ‘Sarah’ and H. ‘Susan’. Halimium halimifolium begins in early June, followed by H. x santae in mid- to late June. These last two continue flowering into July, by which time most Cistus selections are no longer in bloom. Thus, it can be said that Halimium, overall, have a longer flowering season than Cistus. Of the early bloomers, Halimium lasianthum is probably the best known and has a reputation as one of the most reliable. This species is low and spreading, growing to eighteen inches tall and as much as two to three feet across. The foliage is silvery and dense enough to make this an effective groundcover. 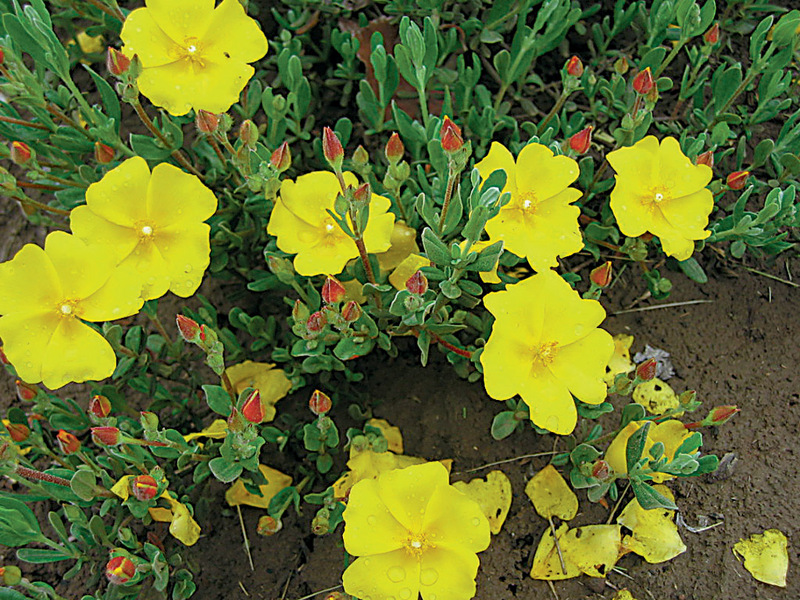 The flowers are yellow, but some selected forms may have a blotch at the base of each petal. 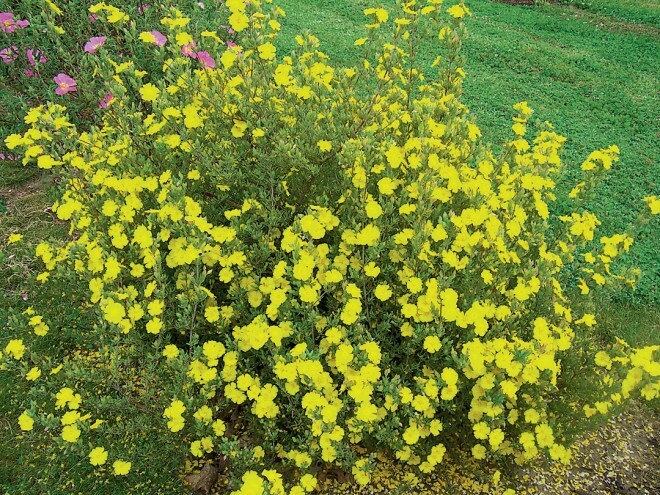 ‘Concolor’ has unblotched yellow flowers, while ‘Farrall’ has unblotched flowers of a deep yellow-almost orange in color. ‘Sandling’ and ‘Formosum’ have blotched petals, the former having a reddish blotch, the latter being more brown. ‘Hannay Silver’ is a vigorous selection, originally collected from the wild in Spain. These have all proven to be good garden plants in the Pacific Northwest, flowering well and maintaining a tidy habit throughout the year. 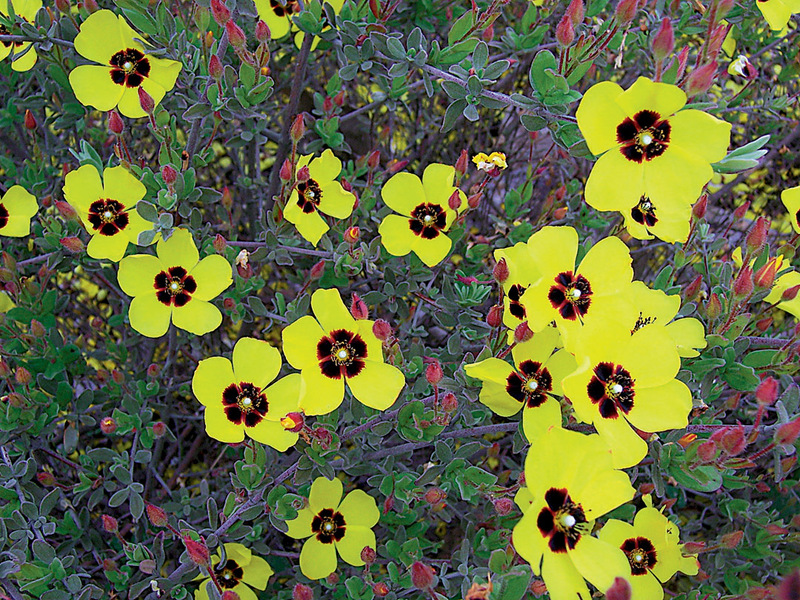 In the 1920s, nurseryman Walter Ingwersen found xHalimiocistus ‘Ingwersenii’, a natural hybrid of Halimium umbellatum and Cistus inflatus, in Portugal. A compact spreading plant, two feet tall by four feet across, it has the honor of being perhaps the earliest and longest-blooming Halimium, with white flowers from late April through early July. 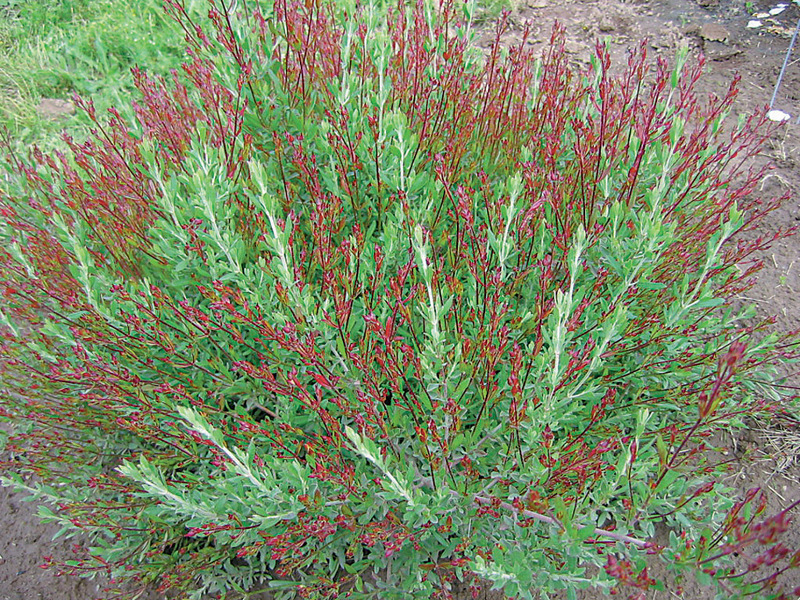 In addition, ‘Ingwersenii’ has excellent form and foliage, both during bloom and after. By early May, many Cistus are in flower, as is xHalimiocistus wintonensis, a hybrid of Halimium lasianthum ‘Formosum’ and C. salviifolius. The original plant was discovered at Hillier’s Nursery around 1910. Reaching two feet tall and three feet across, it has white flowers with a maroon blotch. This is grown in the Pacific Northwest, often represented by the cultivar ‘Merrist Wood Cream’, which, as the name suggests, has a creamy yellow petal instead of white. Another low, but vigorously spreading plant is xHalimiocistus sahucii, with rela tively large (one-and-a-half inch) white flowers. A hybrid between Halimium umbellatum and C. salviifolius, it combines the hardiness of the former with the large flowers of the latter. Both of these hybrids have grown well and remain attractive after flowering. Halimium x pauanum is an upright-growing, silvery plant that begins blooming in mid-May and continues through July. Its parents, H. halimifolium and H. lasianthum, provided the upright habit and the foliage quality, respectively. In many aspects, it is similar to another late-blooming hybrid, H. x santae (H. halimifolium x H. ocymoides). However, the foliage quality of H. x pauanum, particularly after bloom, is superior to either H. x santae or H. halimifolium, and, consequently, it tends to be a better garden plant. All three have a long period of spectacular bloom. Later in May, two of the most distinctive Halimium species come into bloom. Halimium atriplicifolium forms an upright mound of large, silvery leaves, above which the yellow flowers, up to two inches across, are held on long flower stalks. This is probably a true collectors’ plant, being one of the more tender and lacking in some horticultural gravitas. The plant is beautiful in bloom, but, when flowering is past, it looks a bit forlorn. A little pruning to remove the spent flower stalks and any dieback improves the appearance, but the plant overall lacks good form and foliage quality. Halimium ocymoides is a dwarf plant, not more than one foot tall and two feet wide, whose flowers are also borne on long stalks above the foliage. This species is unique in that the flower stalks and buds are reddish, and the effect of the massed, red flower stalks above the foliage is striking, even before the yellow flowers open. These two species are regarded as two of the less hardy in the genus, although I have yet to observe serious winter damage on plants of either species. Also coming into bloom near the end of May are two hybrids, Halimium ‘Sarah’ and H. ‘Susan’. Both were selected by Eric Sammons, a noted Cistus breeder in the UK, from a cross between H. ocymoides and H. lasianthum ‘Formosum’. The two plants are quite different in form and appearance: ‘Susan’ is a fairly dense mound of silvery leaves about one foot tall and two feet wide; ‘Sarah’ is a larger, more open plant, to perhaps two feet tall and wide. Both bear blotched, yellow flowers to one-and-a-half inches across, emerging from reddish buds. The last of the Halimium to come into bloom are H. halimifolium and H. x santae, which, along with H. x pauanum, continue to bloom well into July. The first of these is an upright-growing shrub to three feet, with silvery leaves and unblotched, yellow, inch-and-a-half flowers. In H. halimifolium f. maculatum, the flowers sport a red blotch on each petal. A mounding, silvery shrub to three feet by three feet, H. 5 santae bears unblotched yellow flowers of the same size on long stalks over an extended period. Both are spectacular in bloom and have decent form and foliage retention afterwards. Some of the plants described are still a bit difficult to find; hopefully, some of the better forms will become more commonly grown. Collectively, they offer the garden something quite different from the other rockroses.